Well guys I have been reading where Team #6 already has a bird posted.. All I can say is WOW! I have a hard time thinking about getting one yet with lite snow coming down all day and half the day tomorrow. Then a big storm sometime around Thursday or Friday expecting to hit us. I hear ya Phil! Once i start seeing grass on the ground again it'll be a little easier to get fired up about the birds. No snow in the forecast for the whole week and temps above freezing so maybe it's on its way out, i hope!Seems like the birds don't really show up at any of my spots till just befor season so scouting is a long ways off still. Nothing like hearing that first gobble of the spring, can't wait! I like the team name and banner with Clint Eastwood. I am taking my daughter on a youth hunt this weekend, And my season starts the following Saturday. I hunt public land so no guarantees on getting a bird, but I will guarantee to hunt hard from sunrise until 1:00. Hey sorry just got iPhone fixed but count me in be hunting Ohio season starts towards the end if April good luck team!!! Welcome to the team Pinsapex7! Good luck with the daughter this weekend Bornagain. Can't wait to get my boys after a bird, gonna be another yr or so tho, arms ain't quite long enough yet to hang on to the youth model 870 i have. Looks like the team is coming together! Only 3 left to check in. I've been teammates with both Snapper and DTC, i'm sure they will show. We need to think about getting a captain locked in, Sunday is the deadline. Looks like we have lots of guys that would do the job just fine. I think somebody should just step up and take it, seems like from past yrs voting on it is kinda pointless since everyone always seem to be cool with whoever wants it. Long as its somebody thats on here alot and pays close attention to whats going on. Either Phil or Mottz would do a good job i'm sure, and i have no problem doing it if no one else wants to. Welcome to the team Pinsarex7! We look forward to having you on it.. Do not worry if you get one or not.. It is the enjoyment of going out and trying to find one that counts. Along with all the stories we all post about our trips out there and all. I hunt private land that is open to the public. But I have a long power line with a pipeline running right beside it for 86 miles. No problem for me finding a place to try and knock down a tom. But keep in mind the birds in this area are not quite as large as some of them in the southern part of the state. Or any other area that has plenty of farm land. I have no issue with who ever wants to be the captain one way or the other. I just like all the enjoyment of getting out there and getting it done, and simply enjoying the great outdoors. Oh I am pretty sure that we will have some great luck out there. So once our season starts we will add the pressure to all those other teams.. We will all enjoy our success..
Last edited by Phil from Maine; 03-05-2013 at 06:44 AM. Work is super slow right now, haven't worked at all this week and i'm goin nuts!!!! Gotta a call about 2 o today that broke the boredom. My deer mount from 2012 was finally done! Least i got to go pick that up and get him on the wall. Buddy from work is off tomorrow too and we might go out to some property we can get on and try to shoot some porcupines. Not much but at least somethin cause another day alone in this house and i'll freak!! 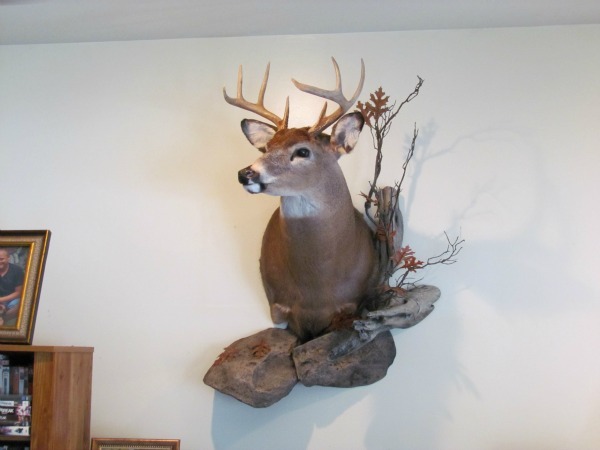 Anyway least the deer mount turned out cool, not huge but looks good on the wall. Last edited by j76; 03-05-2013 at 02:40 PM. Hey Snapper!! How ya doin! Glad to see ya made it! Looks like DTC and Wilcam are the only 2 left to check in. j76, since you did the avatar and name, and thats if everyone agrees on it, I say you just keep going with your flow and be captain. I'm sure we will all follow in behind ya.